As a history major, I know I studied the Russian revolution, especially in the context of WWI. But I'll admit in the years since, little was retained. The generals, sure. Names, dates, concepts. But the particulars are hidden somewhere deep inside my brain...memories that are starting to darken (if you've seen Inside Out). What replaced all that authoritative information is my love for the cartoon movie Anastasia. Anyone? "Once Upon a December"? This was another assigned reading, but it was one I quite enjoyed. I'd forgotten, in the teen fiction fog, how much I enjoy nonfiction history titles, especially those written in a way that tells a story and doesn't just regurgitate facts. Fleming does an excellent job bringing the time, place, and circumstances to life in a way that is accessible, especially to young learners. 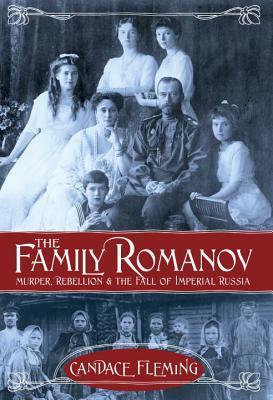 And the story of the Romanov family and their eventual demise is quite interesting. This was a quick and easy read that I highly recommend. And when you're done, settle down with Anastasia on Netflix just for fun.